Moods between two settings is a hard-shift, and might be seen as a negative by some. One of those movies that comic fans will probably get more out of due to the large allotment of characters that pop up and nods towards the drawn art - such as the helmet design seen in the trailer for Thor. 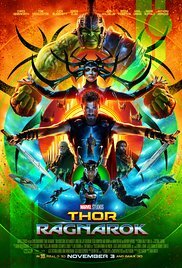 Overall, highly enjoyable movie (although I'd argue more so in the neon-charged pit-fighter planet than the more serious and plot-driving Asgard). Although the oldest of Thor's had humor in it, the sheer amount of jokes thrown at the audience in this one might put some people off - it almost feels more like a Guardians of the Galaxy movie than a Thor movie in that regard - but they should still enjoy it quite well. Rounded out with some nice bits of action as well.